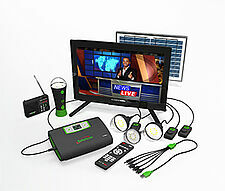 M-KOPA 400 is a solar home lighting system along with a solar powered 15.6? LED Flat Screen. The TV comes with USB/HDMI/AV ports and an aerial that provides free to air channels. Make your payments in full and on time to qualify for exciting products such as mobiles phones, jikos and water tanks.